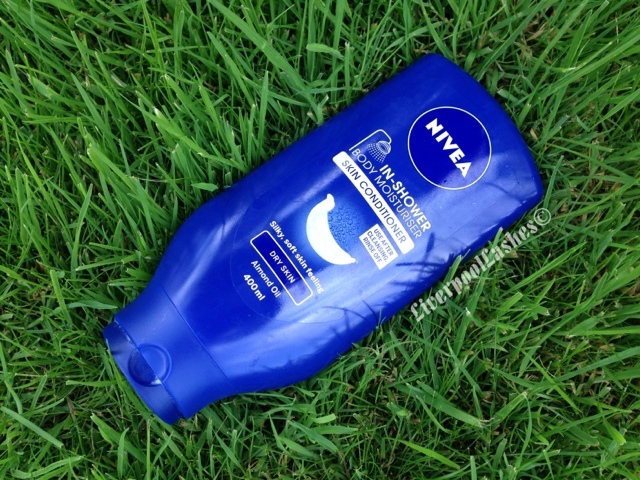 Following on from Tuesday's post and confession, I bought Nivea In Shower Body Moisturiser for the same reasons (something to throw on my legs with little effort.) You can buy this product in two sizes (250ml £3.56 or 400ml £5.10) for two skin types (normal or dry) so I went for the massive one for dry skin. "Discover the new and convenient way to moisturise with the first In-Shower Body Moisturiser from Nivea. The skin conditioning formula is applied straight after cleansing in the shower and is rinsed off immediately to reveal soft and silky feeling skin. No need to wait, the formula is instantly absorbed into wet skin so you can dry yourself, get dressed and go!" Now, straight into the review... I bought this after reading my friend Leanne's Blog about it. The idea of it is that you use your normal shower gel etc and then apply this to your skin and rinse off. The texture is pretty much the same as the average body lotion and it does have the typical clean Nivea scent. The application... firstly it does feel a little odd putting body lotion on whilst stood in the shower but I soon got over this. Once it's rinsed away your skin does feel silky when its still wet. Now the first time I applied it I did it sparingly so realising I needed more I picked the bottle back up and here's where the slight problem lies, you already have the product on your hands so it makes the bottle incredibly difficult to hold. This is probably made worse by the fact I bought the massive bottle but as the packaging is completely smooth I really had to hold on tight. Thinking of this now I remember watching a You Tube video reviewing it and the reviewer also mentioned this but I put it down to nit-picking, trying to look for faults. When I got out of the shower and dried off I feel like there was only a slight difference in the softness of my skin. It felt amazingly soft in the shower but once you've dried yourself I don't think it seemed as soft. The bottom line is... This product is good for someone who seriously has no intention of moisturising after the shower so your skin should be grateful for what it gets! I would use it for these occasions when I don't have time for example or my recent little bit of sunburn where as I've used this and still moisturised when I got out in hope of 'doubling up' on moisture. I hope that Nivea re-design the packaging so that it either has a hook to hang in the shower or a soft grip to it.